Usually when I watch a film with an intense atmosphere (horror, thriller suspense genres), every tense effect that the film had over me dissipates when I step out into the natural light outside of the theatre. However, despite walking out of the UK premiere press screening of ‘Pluto’ at the Edinburgh International Film Festival into extremely bright sunshine, the online exploits I had witnessed and the underlying themes of the film stayed with me long into the night. It took all day for me to fully absorb and come to terms with the meanings of the film and to rationalise everything in my head. ‘Pluto’, also known as ‘Myungwangsung’ is set in a South Korean boarding school for elite students and explores what academic pressures do to the minds and actions of students. The film is all about the repercussions of academic pressure going too far. When the top student in the school Yujin Taylor (Sung June), known to everyone as all students and their ranks are displayed in the school foyer, is found clubbed to death in the woods near the school academic rivalries, paranoia and suspicion reaches dangerous levels. 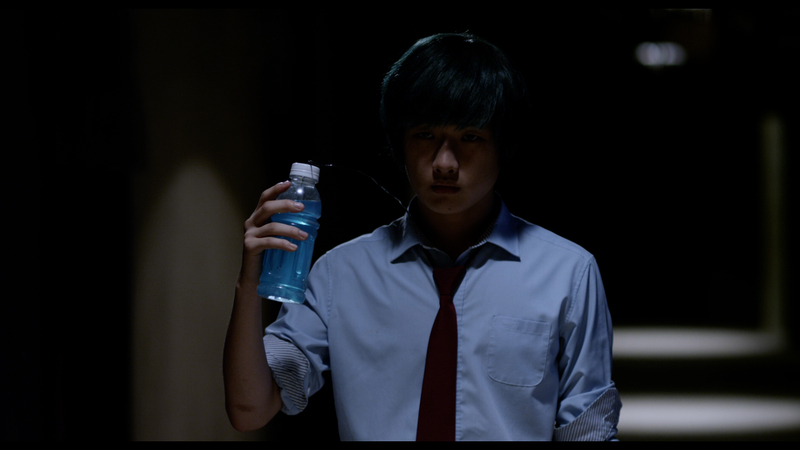 The story follows June Kim (David Lee), a new transfer student, only allowed to transfer because of the suicide of a previous student – who is also the hero or anti-hero depending of your interpretation of the film – as he desperately tries to fit into the school community and his attempts to break into the coveted ranks of the top 10 students in the school. However, the closer he gets to the students in the top 10 he discovers more and more conspiracies within this exclusive group. The top 10 students exchange tips and hints amongst themselves to pass upcoming exams and resort to extreme and disturbing methods to hinder any other students in the school who threaten to take their places. This poisonous atmosphere erupts into further violence and leads to a hostage situation in the schools basement (which was previously used as a torture chamber for special investigations against political dissenters during South Korea’s military dictatorship). The story unfolds in several directions at ones and is set across several periods of time, which can be confusing at times, which is why it takes a while to get your head around. But this is all part of the charm and appeal of the film. The audience is caught up in the same confusion as the students in the story. ‘Pluto’ is a haunting and harrowing viewing experience made flawless by a stellar cast who execute their lines and directions with seeming ease. The attention to detail is stunning, with the editing and lighting delivered in a crisp and direct manner. These elements combine together to create an atmosphere of extreme paranoia and uncertainty for the audience. The film is beautifully subtle, yet somehow in your face and no matter how much you think you understand the film, something will ignite in your thoughts subsequent to the film’s end. The film helps audiences to understand the pressures of the South Korean education system and is dripping with gritty realism. This is most likely due to writer and director Sin Su-won who has experienced these immense pressures first hand. Shin Su-won graduated from Seoul National University (the same elite university that the characters in ‘Pluto’ are all vying for a position at) and started a career as a teacher. During her time as a teacher she published 2 novels that focus on the lives of teenagers. After 10 years of teaching she enrolled at the Korean National University of Arts and studied scriptwriting. After graduating she started her career as a filmmaker. Her experiences of the pressures, competitions and venomous atmospheres surrounding grades and education truly transcend onto the screen to give the audience a real feel for a situation that most will never find themselves in and makes her directorial debut a great success. ‘Pluto’ is a terrifying and genuinely suspenseful film that not only entertains, but gives significant insight into an important social issue that is currently a part of Korean culture. It may yet prove to become a cult film in South Korea and perhaps internationally as its dark styles and mysterious tones work their way under the skins of audiences around the world. Pluto will be screened as part of Edinburgh International Film Festival’s Focus on Korea strand on 22nd and 24th June. For more information about Focus on Korea and all the film times and details, click here. ‘Dark’ doesn’t come close to this film’s portrayal of competition 😀 It really is a vicious plot. 'Dark' doesn't come close to this film's portrayal of competition :D It really is a vicious plot.